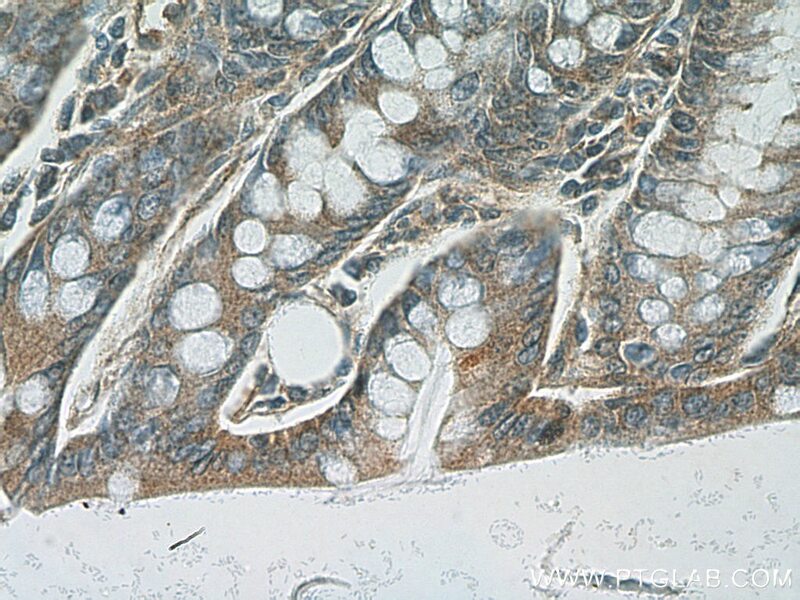 Immunohistochemical analysis of paraffin-embedded mouse colon tissue slide using 12918-1-AP( PDE4D Antibody) at dilution of 1:100 (under 10x lens). 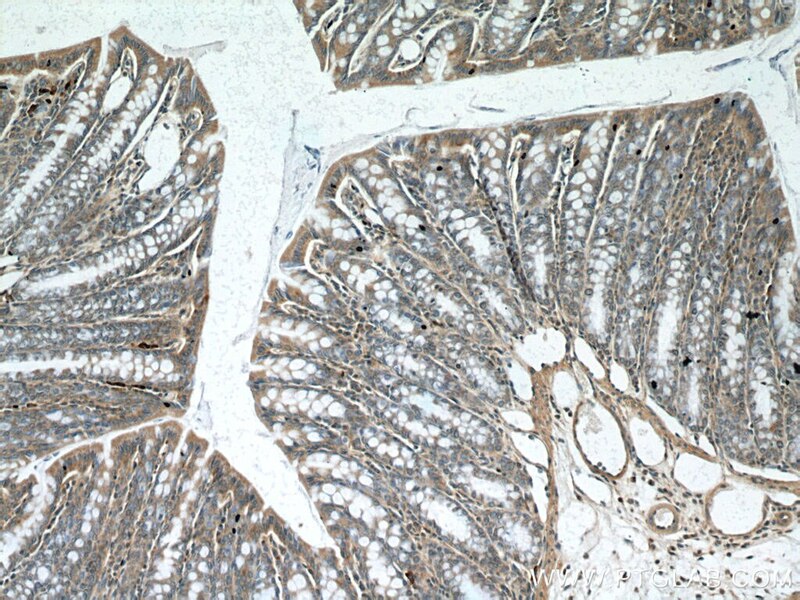 Immunohistochemical analysis of paraffin-embedded mouse colon tissue slide using 12918-1-AP( PDE4D Antibody) at dilution of 1:100 (under 40x lens). PDE4D(cAMP-specific 3',5'-cyclic phosphodiesterase 4D) is also named as DPDE3, PDE43 and belongs to the cyclic nucleotide phosphodiesterase family and PDE4 subfamily. PDE4D subtype may be of particular importance as an antidepressant target in that it is regulated by repeated treatment with both norepinephrine and serotonin reuptake inhibitors as well as by the PDE4 inhibitor rolipram(PMID:16730340). It has at least 9 isoforms and all 9 PDE4D isoforms are expressed in healthy adult human hippocampus and in hippocampus from a patient with advanced Alzheimer disease(PMID:17353396). Interplay between the E2F pathway and β-adrenergic signaling in the pathological hypertrophic response of mouse myocardium. Salt inducible kinase 1 terminates cAMP signaling by an evolutionarily conserved negative feedback loop in beta cells. miR-199a Links MeCP2 with mTOR Signaling and Its Dysregulation Leads to Rett Syndrome Phenotypes. Molecular inotropy mediated by cardiac miR-based PDE4D/PRKAR1α/phosphoprotein signaling.